As reported by the Chicago Tribune on October 14, 2013, the City of Evanston is actively seeking a new and improved Bike Plan in order to provide a safe and enjoyable atmosphere for bicyclists in its community. The City of Evanston wants to create a new bike plan for the suburb and is taking action through education, raising awareness, and working to correct any existing problems that have been reported. 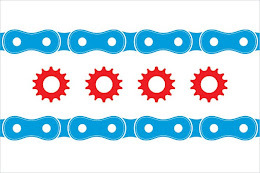 As a part of Evanston's efforts, there will a Bike WorkShop on October 26, 2013 from 9:00-11:00am at Evanston Township High School (1600 Dodge Avenue Evanston, IL 60201) in the school's auditorium. Once the WorkShop has been completed, all attendees are invited to join along in a Bike Tour of Evanston from 12:00-3:00pm. For those interested, the WorkShop will be a great way to learn more about Evanston, ways to stay safe while riding, and gain a bit of insight as to who is making the decisions that may be directly affecting Evanston's plans for bicycling. T.Y. Lin International, an engineering services firm, will be consulting Evanston on this effort and will be attending and addressing any comments or concerns the public may have. If you wish to attend this informative WorkShop, please register online at the City of Evanston's website. The WorkShop and Bike Tour are open to the public. All participants in the Bike Tour must provide their own bicycle and bicycle helmet. Attorney Mike Keating lives in Evanston where he regularly rides his commuter bike to the Central Street Metra station and tows his children to the lakefront in a Burley trailer. Safe bicycling in Evanston is truly a subject of utmost importance in the Keating household and at Keating Law Offices.